French President Emmanuel Macron arrives to attend the EU summit in Brussels, Belgium, Dec. 14, 2017. There appears to be no stopping France's Emmanuel Macron. A newcomer to foreign policy, the French president has developed a huge appetite for the international limelight. 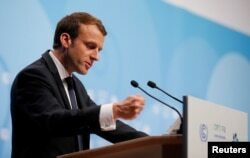 In a bid to boost his country's global clout and promote French leadership, Macron has been positioning himself as Europe's chief spokesman on the great international issues of the day. With German Chancellor Angela Merkel immersed in trying to form a new government, and British Prime Minister Theresa May deep in Brexit negotiations both with the European Union and her divided Cabinet members, Macron has had the field to himself. From the Middle East to North Africa and climate change to Russian meddling, the 39-year-old, France's youngest head of state since Napoleon, has been presenting himself as the fresh face of Western diplomacy, often contrasting his engagement with the unilateralism of U.S. President Donald Trump. 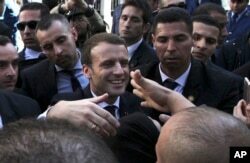 FILE - French President Emmanuel Macron shakes hands as he meets residents in Algiers, Algeria, Dec.6, 2017. The past month, the French leader, who turns 40 on December 21, went on a three-day trip to West Africa, visited Algeria and the Persian Gulf, and held talks with Israeli Prime Minister Benjamin Netanyahu in Paris, where he criticized Trump's decision to formally recognize Jerusalem as Israel's capital. On Dec. 12, he hosted a major climate change summit marking the second anniversary of the Paris deal aimed at reducing greenhouse gases. He then hosted in the French capital African leaders to discuss the fight against Islamic extremism. Macron's activities on the world stage have prompted a surge in popularity in his home country, despite claims by foes that his efforts are mostly theatrical and have not borne fruit. Other European leaders have expressed irritation with Macron for pursuing largely uncoordinated diplomatic interventions. 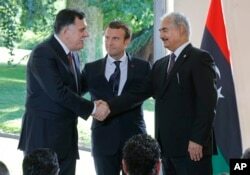 Libya's Prime Minister Fayez al-Sarraj of the U.N.-backed government (L), and General Khalifa Hifter of the Egyptian-backed commander of Libya's self-styled national army shake hands as France's President Emmanuel Macron stands between after a declaration at the Chateau of the La Celle-Saint-Cloud, west of Paris, France, July 25, 2017. In July, Italian ministers openly criticized Macron for organizing a meeting in Paris of the leaders of two of war-torn Libya's rival factions to discuss a political power-sharing deal. They argued the French leader's efforts were distracting from a coordinated U.N. and European Union effort to engineer a political settlement in Libya among three rival governments and dozens of militias. Italy's foreign minister, Angelino Alfano, complained of "too many open formats in Libya, too many mediators, too many initiatives." An opinion poll published Sunday suggests Macron has turned around a record slump for a new French president and secured an "unprecedented" bounce back, thanks to his overseas forays, according to French newspaper Le Journal du Dimanche. A survey conducted for the newspaper found 52 percent of respondents are now satisfied with Macron — up from 40 percent in August. In order to make his mark on the world stage, the French leader has at times acted purposefully as a foil to Trump, contrasting his foreign policy vision based on multilateralism and committed to rules-based cooperation with the U.S. leader's America First agenda. FILE - French President Emmanuel Macron speaks during the COP23 U.N. Climate Change Conference in Bonn, Germany, Nov. 15, 2017. After Trump pulled the United States out of the Paris climate change pact, Macron announced that France would become a "second homeland" to climate researchers and make good on the loss of American funding of climate research — all in order to "make our planet great again," a jab at Trump's "Make America Great Again" slogan. Nonetheless, since his stunning election upset six months ago, Macron has been able to maintain warm relations with the U.S. leader, according to officials on both side of the Atlantic, who say he enjoys the best relations with Trump of any European leader. "Macron has cleverly balanced charm and challenge when it comes to Trump," said a British diplomat. "The two most talked about Western politicians of the last electoral cycle may be standing on opposite sides of the ideological spectrum, but they get along pretty well. While they disagree starkly on global action, on climate change and the Iran nuclear deal, the fight against terrorism brings them together," according to analyst Célia Belin. Terrorism isn't the only thing that brings them together. They are both political outsiders — neither held elected office before their recent presidential wins. Trump, argues Belin, "perceives Emmanuel Macron as a maverick, capable of taking risks, and as an ambitious leader who wants to shake things up." On climate change, Macron was careful last week to soften his criticism of Trump's disdain of the Paris climate change accord, saying, "I'm pretty sure that my friend President Trump will change his mind in the coming months or years, I do hope." Next year, differences on Iran risk impacting the Macron-Trump relationship. The two are diametrically opposed when it comes to the Iran nuclear agreement (Joint Comprehensive Plan of Action, or JCPOA) and whether it should be preserved. Macron plans to visit Tehran early in 2018, and that trip could bring their differences to a head — although, like Trump, he remains worried about Iran's ballistic missile program and its growing military clout in that region. That aside, there was appreciation in the White House, said U.S. officials, for Macron's skillful mediation last month in Lebanon's political crisis and his role overseeing Lebanese leader Saad Hariri's exit from Saudi Arabia and return to Lebanon via Paris. This allowed Hariri a way out of an impasse that risked confrontation between Tehran and Riyadh.